When it comes to creating the ideal bathing experience, West Shore Home’s bathtub shower combos give you the best of both worlds. 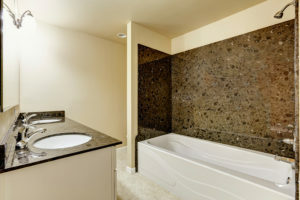 Whether you prefer a quick shower or a long, lazy soak in the tub, we can revamp your existing bathroom in just one day with a beautiful tub shower combo made to your exact specs. Choose from a full range of colors and finishes, different tile patterns for the wall surround, and optional add-ons like shelving, seating, grab bars and more, to create the bathing experience you’ve always dreamed of. Our tub shower combos are crafted from hardwearing, nonporous acrylic that resists cracking, chipping, and staining so your tub and wall surround will look brand new for years to come. This acrylic features an antimicrobial agent that prevents mold, mildew, and other bacteria from forming and reproducing, making it easier for you to maintain a clean and fresh bathing area. And, to minimize any disruption to your daily routine, our company-employed installers will have your new bathroom ready in just one day. Products and labor are both protected by solid lifetime warranties, and we also offer a number of convenient financing options to help make your new bathroom as affordable as possible. Contact West Shore Home today to learn more. Our expert bathroom installers proudly serve the cities and surrounding areas of Pittsburgh, Harrisburg, Lancaster, and Tampa.